I often refer to instructional technology (IT) as a large, deep ocean. Large because of the many technologies out there to potentially aid teaching and learning, deep in terms of the numbers of products, vendors and features that need to be weighed prior to a purchasing decision. My colleague, Natalia Kapli, and I did some preliminary work on characterizing the various IT categories for the purpose of understanding what the field of instructional technology covers. The IT List is in its formative stages and we can certainly make additions or changes to this list as needed. Feel free to respond with any such changes as you see fit. I find it a useful starting point for the conversation regarding whether a college or institution engages in a systematic approach to instructional technologies. So let’s imagine that we, like the early explorers, are considering this journey across the ocean called “instructional technology.” What are the questions worth asking? Is the crossing worth it? Why would we attempt such a journey? This is the “why” issue and certainly there are many compelling arguments that point to the importance of instructional technology in teaching. I have attached a slide from a recent presentation of mine that addresses this fundamental issue. If we are serious about our educational mission, not using the potential of instructional technology borders on pedagogical malpractice. Where do we hope to end up? This is the “where” or goals issue. As Steven Covey suggests as one of his “Seven Habits for Highly Effective People,” “begin with the end in mind.” As with many things, it’s not so much the destination, but the journey that is important. For the pace of technology innovation will always exceed the capacity of staid institutions to effectively respond. When one technology is successfully implemented, three others come to either supplant it or even make it unnecessary. Rather than become enamored with one technology or another, it’s advisable to be open to change and carefully pilot new innovations prior to fully committing to them. Was it not that long ago that many campuses were giving laptops to all incoming freshmen? Would now an IPAD or tablet be more appropriate? How can we prepare for such a journey? This is the process question followed up by a resource question. The funders or backers of this expedition need to be assured they have a reasonable chance to have a successful outcome. Hence, careful research, planning, piloting and budgeting are all essential elements in this process. In addition, it makes sense to canvas all stakeholders to make sure they are “on board” for the trip. The issue of budgeting will address all the provisions needed for the journey, boat and crew. It is not sufficient, for example, to purchase a technology without also budgeting in training and support costs to better ensure successful implementation. It is axiomatic that cash-flow issues often bankrupt small businesses leading to failure. The same can be said for well-intentioned, but under-funded IT projects. Do we have an experienced, reliable captain and crew? You wouldn’t attempt an ocean crossing in a dingy, and especially one filled with non-experienced sailors. On some campuses, audio/visual people are pressed into service to evaluate instructional technologies, or people with technical skills who have never taught, or professors who have little project management expertise. All of these individuals could have real input in a project team convened for this purpose. This is how Penn State and other schools evaluate IT–with teams of experts who then make recommendations to their respective administrations. I would also suggest that there needs to be an IT “captain” who can assemble the crew, motivate the crew, and lead the crew across that ocean. It is a sad commentary on the state of many campuses that such a designation of responsibility has yet to happen, nor the establishing of an office for this purpose. Does the crew understand where they’re going and their role? Occasionally, it may be a good idea to tell your staff what you’re hoping to accomplish and how their efforts are critical to the success of this journey. Failing that, you risk lethargy at best, and mutiny at worst. It is shocking to me that after all we know about good management practices, the one practice that consistently is lacking on campuses is good communication and follow-through. Often, once a strategic plan or initiative is announced, it is never heard of again. This can only ensure cynicism, if not outright sabotage, of new initiatives. How can we tell if the journey has been a success? We may explore and map new oceans and continents, but at what point has our journey been worth the effort? Are there course milestones to meet? What are the projected benefits of the journey and have they been actualized? Is it possible to declare victory and start a new journey? So many initiatives, whether they be technology or teaching, are abandoned or merely peter out. Can we honestly examine these, learn the lessons, and maybe promise not to repeat them in our next trip? It is imperative that the journey be documented, assessed, and summarized for future generations of explorers. Instructional technology, like most endeavors worth starting, needs real answers to the questions posed above. The instructional technology waters are fraught with the latest over-hyped solutions, overpriced and under-performing software, vendor bankruptcies and mergers, legal and accountability issues and a myriad of other complicating factors. Without a real plan for the IT voyage, you are more likely to be shipwrecked than successfully cross that ocean. May your journey be a safe one. 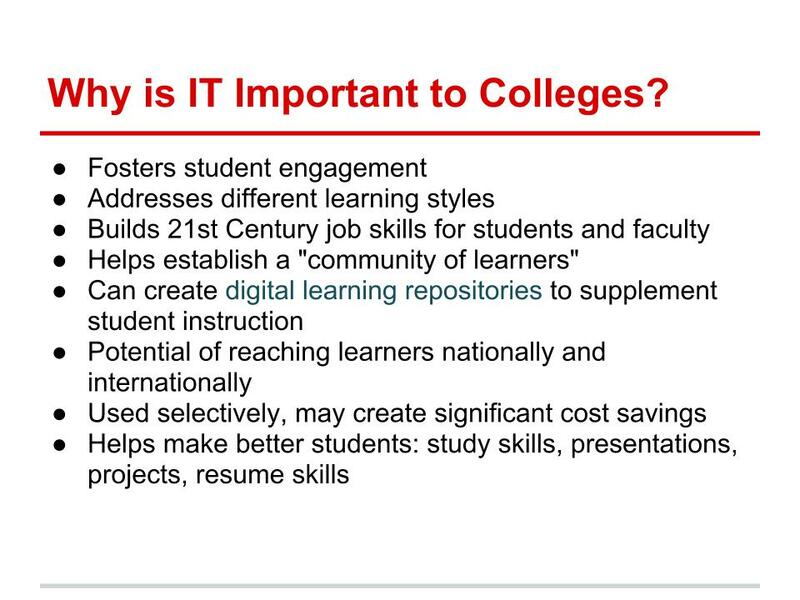 Slide below source: Taken from a presentation by Bruce Rosenbloom on May 24th, 2012 concerning Instructional Technology at CCNY. This entry was posted in Envisioning Online, Instructional Technology. Bookmark the permalink. Thanks for that IT list, Bruce! It’s a valuable resource. Might be a good idea to link back and forth with the ongoing list here http://commons.gc.cuny.edu/wiki/index.php/Kitchen_Sink/Kitchen_Table_Utilities which covers some of the same tools–but some others, too (and of course some differences in classification). It seems the IT List is very scanty on Mac tools…might want to add those! The question you ask above “Was it not that long ago that many campuses were giving laptops to all incoming freshmen? Would now an IPAD or tablet be more appropriate?” is one that we face every semester. We do give all our students laptops (MacBook Pros) and it’s a very intentional choice. Right now, as things stand, there are two main reasons why we can’t switch to iPads or any other tablet. The first is video editing and production. That’s something our students do in their seminars quite frequently, to good effect, and there just isn’t a tablet app yet that can really do that. There is an iPad version of iMovie (and several similar apps), but it’s really crippled. Not all effective for the tasks our students need to do. The other issue is the keyboard. Unless we’re also going to purchase external keyboards, there just isn’t yet a tablet solution that will work for typing (for example) a 20-page research paper. Right now, until there are some serious tablet advances, tablets are still going to have to be seen as something you use with a computer, not instead of a computer. That might change in the next few years! Just picking out one small question of the critical questions you’re asking. Nice post!